While the vote on this Synod's final report (Italian fulltext) was the expected business at tonight's closing session, even the crucial summary text was overshadowed by one last speech from the Pope, containing some of his strongest language to date as he reflected on the several "temptations" he saw at play over the last two weeks. According to the press aides at tonight's briefing, the 10-minute address was accorded a standing ovation of four to five minutes from the floor upon its completion. 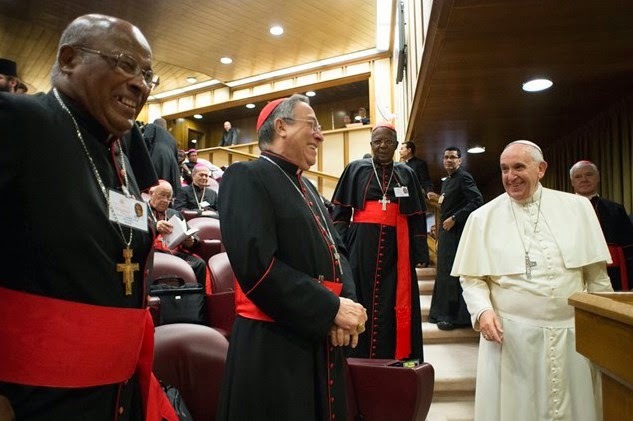 Among other developments, Francis announced that the assembly's 62-paragraph closing report – three of whose grafs failed to attain the required two-thirds passage – would be given to the episcopal conferences as the Lineamenta (first agenda-draft) to begin the consultations for next year's Synod. In the case of the US bishops, the document is likely to be discussed in executive session at next month's plenary in Baltimore, when the bench's allotted three delegates to the October 2015 assembly will likewise be elected; beyond that trio, as members of the 15-man Synod Council, Cardinals Donald Wuerl of Washington and Timothy Dolan of New York are already assured of seats at the next meeting. 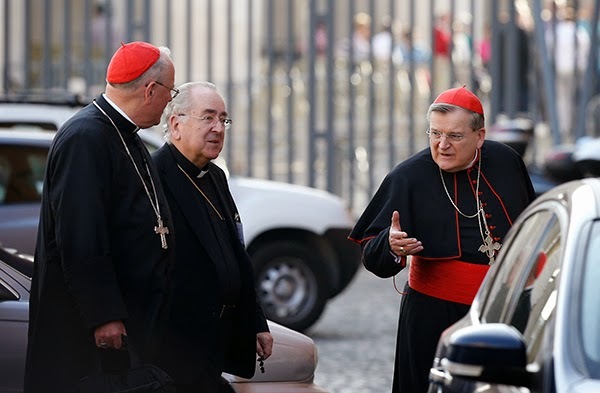 On another front, meanwhile, a day after giving public confirmation of his expected departure from the Apostolic Signatura to the significantly lesser post of patron of the Order of Malta in an interview with Buzzfeed, in a conversation today with Catholic World Report, Cardinal Raymond Burke (above right) told the conservative outlet that he expected the move's formal announcement to be made "before the beginning of November." While the assembly's business is now in the books, the Synod formally closes with tomorrow's morning Mass in the Square at which Francis will beatify the entity's founder, Pope Paul VI – whose liturgical feast will henceforth be celebrated on his birthday, September 26th. 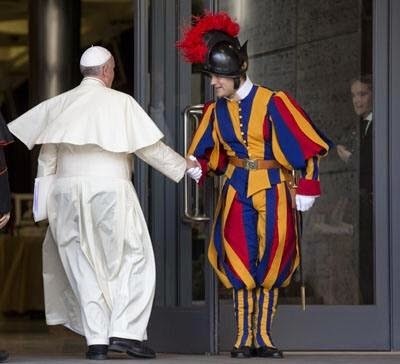 All around, meanwhile... well, when it rains, it pours – and ironically enough as a Synod on the Family wraps up, that's got this scribe late for a wedding. - One, a temptation to hostile inflexibility [trans: rigidity], that is, wanting to close oneself within the written word, (the letter) and not allowing oneself to be surprised by God, by the God of surprises, (the spirit); within the law, within the certitude of what we know and not of what we still need to learn and to achieve. From the time of Christ, it is the temptation of the zealous, of the scrupulous, of the solicitous and of the so-called – today – “traditionalists” and also of the intellectuals. For Orange's Own, "The Veil Is Lifted"